Albert Moses. Photo by Ross Fenton. The Harvard Project’s Honoring Nations program has announced the selection of 18 semifinalists for the 2018 Honoring Nations awards. Among those selections are a variety of outstanding programs exemplifying self-governance and resource management, which includes the Tulalip Tribes ongoing demonstration of sovereignty through stewardship. Tribal communities in the Pacific Northwest have long-standing relationships to ancestral lands now managed by federal land management agencies. Generally speaking, during the centuries before colonial expansion, Indigenous peoples were profoundly connected with their natural surroundings. These cultures approached the natural world with an attitude of reverence and stewardship rather than dominion. In recent years, federal and state governments have increasingly recognized tribal rights to cultural resources on public lands and to participate in their management. In the summer of 2009, three Tulalip staff accompanied the Skykomish District Ranger to a remote high elevation area of the Mt. Baker-Snoqualmie National Forest (MBS). This 1,280-acre area located 5,000 feet up in the mountainous highlands is now referred to as swədaʔx̌ali, a Coast Salish Lushootseed word for ‘Place of Mountain Huckleberries’. “Over the last seven years, since the area’s formal designation, Tulalip has guided the management of this special area based on tribal values and ecological knowledge, and in direct support of the treaty, cultural, spiritual, subsistence and educational needs of our membership and our future generations,” explained Libby Nelson, Senior Environmental Policy Analyst for Tulalip’s Treaty Rights Office. 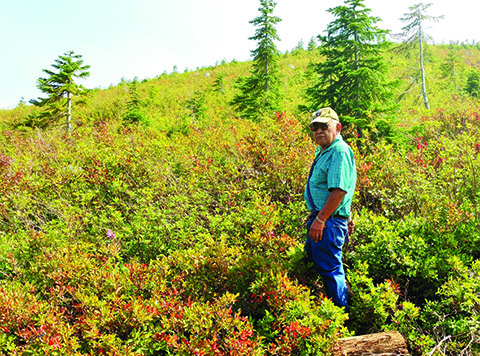 “For example, rather than allowing continued encroachment of conifers that would eventually shade out huckleberries and other associated plants, Tulalip staff will remove many of them to stall natural succession in certain areas at swədaʔx̌ali. This will allow us to maintain productive berry fields and other cultural plants of importance, and enhance habitat for wildife that forage in open meadows. 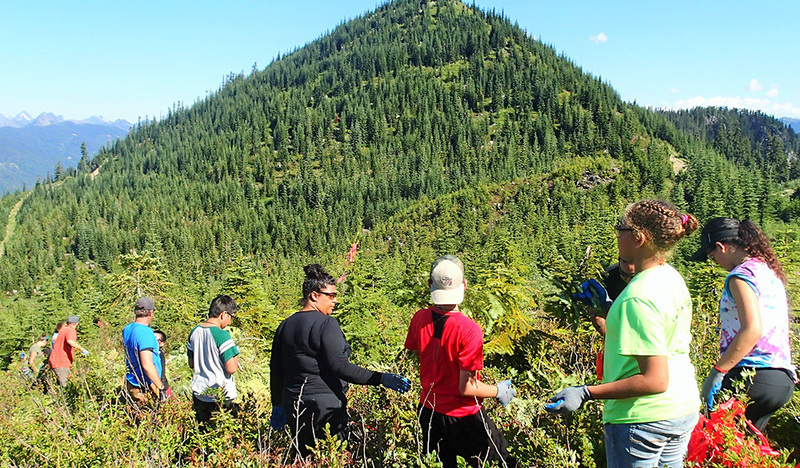 Tulalip Mountain Camp began in 2015, providing an annual weeklong, overnight natural resources and culture camp for middle-school tribal youth at σωəδαʔξ̌αλι This outdoor program seeks to connect youth to nature in a remote setting, teach them about their ancestral lands in the mountains, and engage directly with elders and our natural resources staff in huckleberry enhancement. This camp program has had a very positive impact on youth participants, as measured by camper surveys, feedback from families, and the significant number of return campers each year. This initiative at swədaʔx̌ali is not only relevant to Tulalip culture, but is designed specifically to help sustain it. Continuation of tribal lifeways is dependent on having the resources that support these lifeways, access to them, and opportunities to transfer tribal knowledge and traditions to our youth. The 1,280-acre mountain area that constitutes σωəδαʔξ̌αλι, offers not only a diversity of habitats, plants and animals, but also remoteness, solitude and a relatively pristine environment needed for many cultural activities. The Harvard Project selected Tulalip’s ongoing stewardship of swədaʔx̌ali as a semifinalist for the 2018 Honoring Nations awards. As such, Tulalip’s commitment to stewardship is an active exercise in self-determination and implementing effective solutions to common governmental challenges in the areas of environmental research and resource management.